Decorations: Bronze Star, World War II Victory Medal, Asiatic-Pacific Campaign Medal, American Campaign Medal, Navy Good Conduct Medal, Presidential Unit Citation. Pre AVG: Known to all by his middle name, Paul was born and raised in Worcester, MA, the younger of two boys. During his youth he spent many after school hours in the pool at the Lincoln Square Boys Club and was a New England Boys Club diving champion. He graduated from Commerce High School in 1936 and in December of that year joined Co. B, 181st Infantry Regiment of the Massachusetts Army National Guard, which is one of the nation’s oldest regiments first formed in 1636. He was discharged in November 1939 to enlist in the US Navy. He enlisted in the US Navy on November 27, 1939. After boot camp in Newport, RI, he was sent to San Diego, CA where he was assigned to Torpedo Squadron 5, VT-5, aboard the aircraft carrier USS Yorktown, CV-5. He first worked as an apprentice to an Aviation Machinist, but due to a shortage of staff and because Paul could type, he was reassigned within the squadron as a Yeoman. Paul was on the ship when it participated in Fleet Problem XXI, a two-part exercise which included some of the operations that would characterize future warfare in the Pacific. Following the conclusion of Fleet Problem XXI the USS Yorktown operated in the Pacific off the west coast of the United States and in Hawaiian waters until the spring of 1941. It was then part of a substantial force ordered to reinforce the Atlantic Fleet. The USS Yorktown departed Pearl Harbor on April 20, 1941, transited the Panama Canal on May 6 and 7, arrived in Bermuda on May 12, and began conducting patrols and convoy protection in the Atlantic. While the ship was docked in Norfolk, VA, Paul learned of the effort to recruit volunteers to help the Chinese and defend the Burma Road. 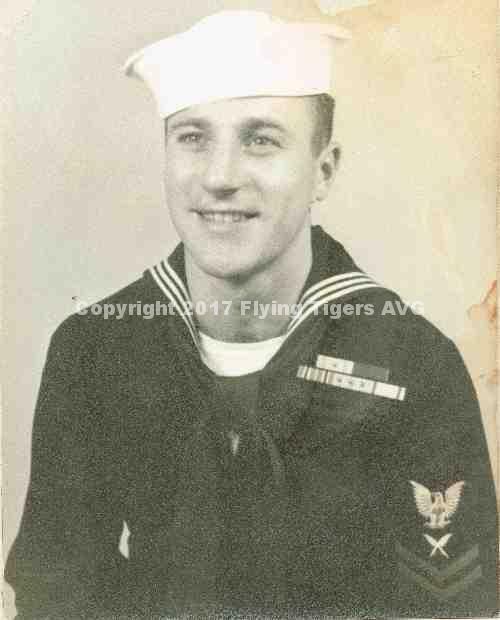 He had always wanted to see China so, along with his shipmates Morton “Twisty “ Bent (they would later marry cousins) and Joseph Lussier, he signed on with the American Volunteer Group and was discharged from the US Navy on July 24, 1941. When WWII began the USS Yorktown went back to the Pacific where it was severely damaged in the Battle of the Coral Sea and in early June 1942 was sunk at the Battle of Midway. Paul always said how fortunate he was to have joined the Flying Tigers as, due to the location of his battle station, he almost certainly would have been killed during one of those battles had he stayed aboard the USS Yorktown. AVG Service: After a short leave spent back in Massachusetts Paul traveled by train to Los Angeles where he boarded the Zaandam, a Dutch passenger cargo ship, and on August 26, 1941 set sail on the voyage across the Pacific to the Far East. His passport listed his occupation as a mortician. Upon arrival in Rangoon, Burma he was assigned to the 3rd Squadron, Hell’s Angels, as an Operations Clerk, which really meant he did whatever needed to be done to keep the squadron operational. He served in Rangoon and Toungoo in Burma and was wounded in the right arm and leg by shrapnel from a Japanese bomb on December 25, 1941 during the famous Christmas Day air battle in the skies over Rangoon. When the AVG left Burma, Paul drove a truck filled with supplies over the Burma Road to China crossing the bridge at the Salween River Gorge. Shortly after, the bridge was blown up in an attempt to stop the advancing Japanese forces. While in China he served in Loiwing, Paoshan, and Kunming. When the AVG disbanded on July 4, 1942, he received his Honorable Discharge. Post AVG, WWII: Paul got a ride over “the Hump” to India on a cargo plane. He hitched rides from Calcutta across India to Bombay where, after some difficulty, he managed to secure passage back to the United States on the SS Mariposa. The voyage took him around the Cape of Good Hope. Disembarking in New York City he made the last leg of the trip back home to Worcester, MA by train. Paul re-enlisted in the US Navy in Boston, MA on November 9, 1942. As a returning Flying Tiger, he made several appearances at rallies to promote the sale of war bonds. Inspired by his service with the AVG, Paul applied, was accepted, and began training as an Aviation Cadet. He trained at Williams College, Williamstown, MA, Lenoir Rhyne College, Hickory, NC, USN pre-Flight School, Athens, GA, and The US Naval Air Station, St. Louis, MO. Paul successfully completed Aviation Cadet training, but did not get his wings because he could not pass the final eye examination. Toward the end of the war he was transferred to the US Naval Base at Port Hueneme, CA where he processed out returning sailors. He was honorably discharged as a Yeoman 2nd Class on December 4, 1945. After a short stay with relatives in California, he returned with them to Massachusetts. Post War Career: Paul married Dorothy A. Rudge on January 28, 1947 in Worcester, MA. Paul spent most of his working life as a representative for the Metropolitan Life Insurance Co. In 1950 they purchased a home and moved to Sterling, MA where they raised their four children. Paul was active in civic and church affairs. He was a Past Commander of American Legion Post 189 and led the local United Way campaign. He helped to raise the funds to build St. Richard of Chichester, Sterling’s Roman Catholic Church, was active in its Men’s Club and St. Vincent de Paul Society, and was the Secretary of its Annual Horse Show for many years. Paul and Dorothy spent most of their retirement years living in Las Vegas, NV where they indulged in their lifelong passion for ballroom dancing. In the Las Vegas ballroom dancing community they were affectionately known as “The Gliders” for their smooth style and graceful moves on the dance floor. Paul passed away peacefully at 89 years of age in a Las Vegas hospice surrounded by his family during the playing of the National Anthem and the flyover for the opening ceremonies of the first game of the 2007 World Series at Fenway Park between his beloved Boston Red Sox and the Colorado Rockies. The Red Sox won that game and went on to a four game sweep of the Rockies.